As we near the holidays, my thoughts often go back to my grandmothers. They were in some senses polar opposites but both strong and determined women. My paternal grandmother (henceforth referred to as “Grandma”) was the quintessential farm wife. She had a rough life growing up, having eight brothers and sisters. Their family tried to survive on my great-grandfather’s teaching salary, but they didn’t have anything. Grandma, the oldest daughter, was fostered off to live with her grandparents, about two hours away from her family. I never heard her complain about her youth, but she did not talk often of this time. She finished high school while living with her grandparents and then found help as a “hired girl.” In her twenties, she married my grandfather and they rented land to farm and live on. Grandma was a strong woman of pioneer stock. (Her grandparents had “made the run” into Oklahoma, albeit a late one.) She was used to making do with what they had. She was a great cook and I remember her making special birthday meals for us growing up. I also remember her making us some really special clothing—like a “Pollyanna” dress that she had hand-smocked. She never had the opportunity to go to college, but she was one of the smartest women I ever knew. She amazed me once during my college days by reciting half of Macbeth to me, the smug English major. She also whipped my sister and me at Trivial Pursuit. 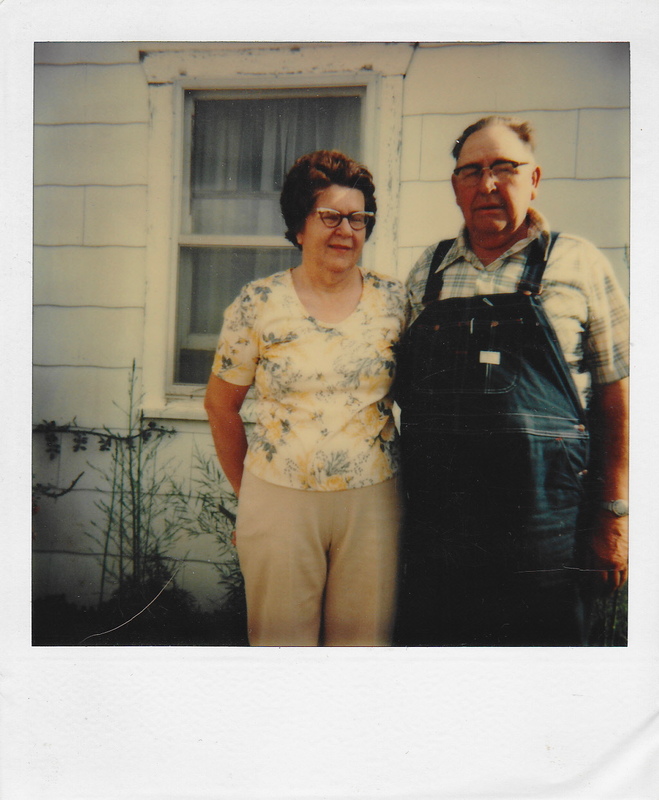 My maternal grandmother (henceforth referred to as “Grandmother” because that is the way she always signed her notes) was a career woman and a farmer’s wife. Grandmother was born in 1907. After high school, she attended Oklahoma A&M to receive a “lifetime” teaching degree. Her sister also attended Oklahoma A&M and together, not knowing a soul, they took teaching jobs in two separate towns in far western Oklahoma. They were both courted and married local boys. (I like to imagine the gossip about these two young ladies, heading to the wilds of the Panhandle without a care in the world. Brave souls, both.) She also served as a school principal and later a school board member. Another one not to complain, she also had a hard life in the harsh environment of the western part of our state. She battled some form or another of cancer most of her adult life. (My uncle told me she had a cancerous spot removed from her hand when she was twenty.) She battled breast cancer (in the sixties where she had to endure a double-mastectomy and Cobalt treatment), bladder cancer and lymphoma. She lived well into her eighties despite these conditions. 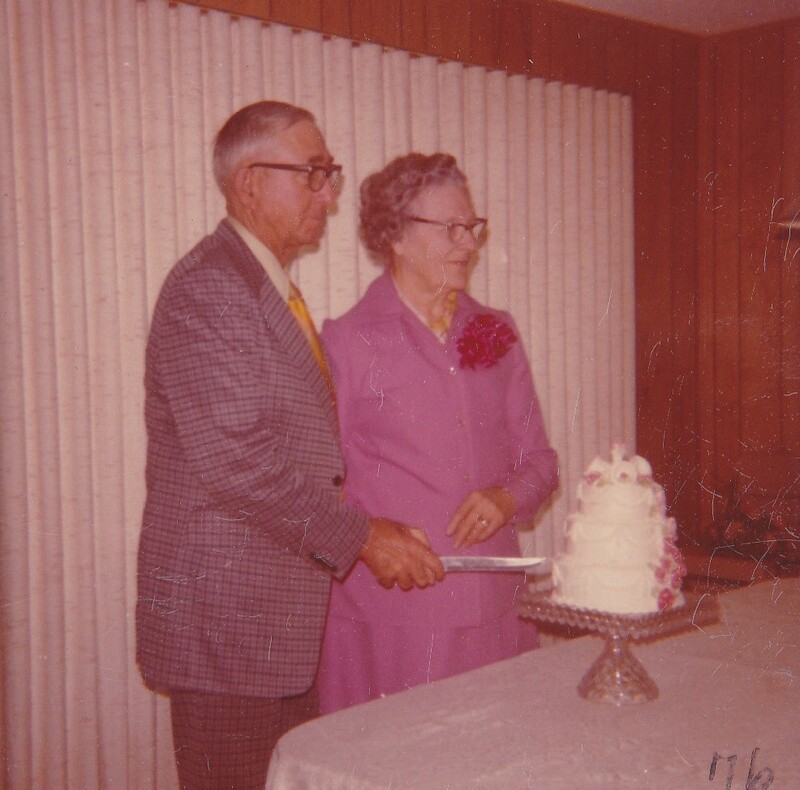 Her husband, my grandfather, was not expected to live past the age of thirty and was even taken to the Mayo Clinic. (None of us are really sure what the condition was to merit this trek from Oklahoma to Minnesota in the 1940s). In the 1970s, he had open heart surgery which affected him greatly. After the surgery, he was destined to take dialysis treatments three days a week which caused my grandmother to drive him on a 120 mile round trip about every other day. Again, she was not one to complain. Grandmother and Granddad on their 40th wedding anniversary. I really didn’t want to make this post maudlin at all, but nostalgic. Both grandmothers were easily led to tell stories of the Depression and how they coped. Grandmother once told me how they fed the students in the one room school that she ran. Each child brought something the family could spare—a couple of potatoes, a wild rabbit, a home-canned jar of something—and it all went into a pot on top of the wood stove in the school. That was lunch and it might be all a child had to eat that day. I remember Grandmother always with a crochet hook in her hand. I remember Sunday dinners and holiday meals when we were all together as a family with uncles, aunts and really cool older cousins. Grandmother was set in her ways and you did not want to be the one caught that was tasked with cleaning out her refrigerator or cleaning her kitchen. As a young adult during the Depression, she threw nothing (and I mean nothing) away. Woe be it if you interrupted her “programs” in the afternoon,too. Well, let’s get to the recipe for today. When we bought the bushel of Jonathans on our KC trip, I vowed to make apple butter. 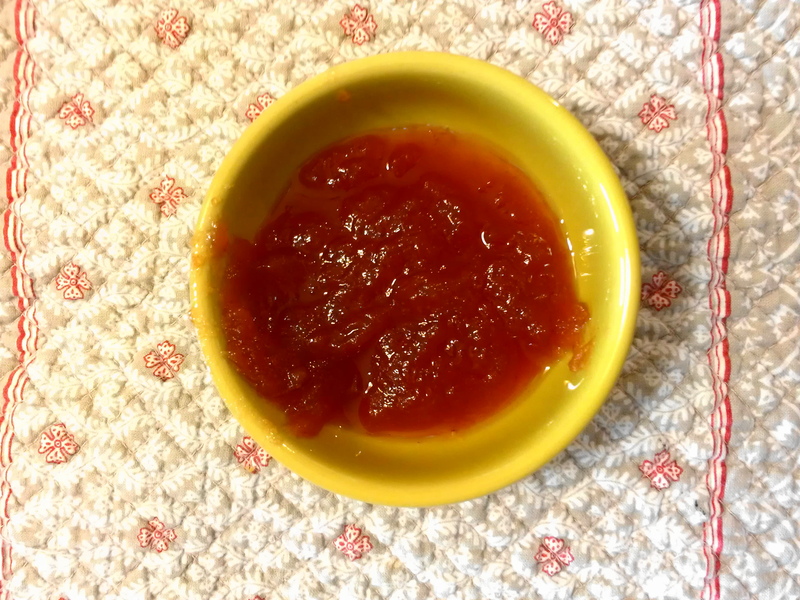 As family tradition has it, this is my Grandma’s famous apple butter recipe but I had to go to the recipe book of compiled recipes from Grandmother’s kitchen to find it. A phone call to mom confirmed that it was a favorite of both families. I’ve updated the directions here a bit. Core and slice apples, but do not peel. Place apples in a large kettle and add just enough water to cover the bottom of the pan. Simmer apples until soft and mushy. After you get 16 cups of apple pulp, add all ingredients to a large kettle. Bring to a boil stirring often and then reduce heat to a simmer. Cook until mixture is smooth and “remains a smooth mass when a little is cooled on a plate.” (I found about two hours worked well). Stir frequently to prevent sticking. The mixture will darken to a light mahogany color. During the final hour of cooking, prepare and sterilize jars and lids. Also start heating a canner for the water bath. Pour hot butter into sterilized hot jars and place on lids. Screw on rings and then water bath for 10 minutes. Remove lid from canner and let set for 5 minutes before removing. You can see how the color just gets deeper and deeper as you cook it down. I started out with two full pots (with 8 cups of apples in each) and then combined them into one pot after about an hour of cook time. I ended up cooking this batch about two hours. As it cooked one Sunday afternoon, The Hubs wandered in the kitchen. He commented that it smelled just like his Grandma’s kitchen, too. This must have been every grandma’s apple butter. We canned up a huge batch of 9+ pints of dark mahogany apple butter. Family from all sides is already calling for dibs on jars. Stay tuned for some recipes that use apple butter (for sure)! Great post and pics! Your apple butter looks delicious! I haven’t made it in years so thanks for reminding me of it and the recipe! Thanks for stopping by, Pam, and glad I could inspire and remind you! This is such a sweet and lovely tribute to your grandparents. The apple butter looks great and I look forward to your recipes with apple butter. I have found some pretty good ones. Stay tuned, Angie. Wonderful Wonderful Wonderful tribute to your Grandmother. I enjoyed every word. People just melt away after they are gone like they never existed. It’s a deep sign of love and respect to share what you shared. A salute to your Grandmother!!!! And, don’t forget Grandma! It didn’t dawn on me until I wrote this post that we called my maternal grandfather “Granddad” and my paternal grandfather “Grandpa.” So yes, some things just melt away. I wish I could send a pint your way! Loved reading this about your grandmothers. Thanks for sharing. Growing up in the middle of Kansas, it all sounded very familiar. I never knew my grandmothers, however. And the apple butter brings back memories of all the farm wife cooks I grew up with. Wow, haven’t had it in ages. Lovely tribute! So nicely written. Great photos, and wonderful recipe. Excellent post — thanks. I can’t tell you how much I enjoyed that post. I am a sucker for old family stories, what a loving tribute. Our grandparents sure had it harder than us but they lived a simpler life. Hard work. Your grandmother was quite a woman! As I was reading this, I kept thinking about my mother, especially the parts of her not being a complainer and being so very smart even though there was no college education. That was an interesting tidbit about her beating you at Trivial Pursuit. That’s a hard game. 🙂 Thanks for sharing her recipe for apple butter. I didn’t include this in her story, but she had to go back to school to get some more training (I think the state began to re-think the lifetime teaching degrees) and she ended up attending AGAIN at the same time her oldest son attended in the fifties. Yep, we are a cowboy family, Kelli. What an inspiring story, Debra. I really enjoyed it. I think we need to be reminded every now and again of how life was during the time of our grandparents and even our parents no matter what era. There’s so much to learn and appreciate. Am sharing the apple butter with mom and sis today. Makes us all remember those who aren’t with us today.